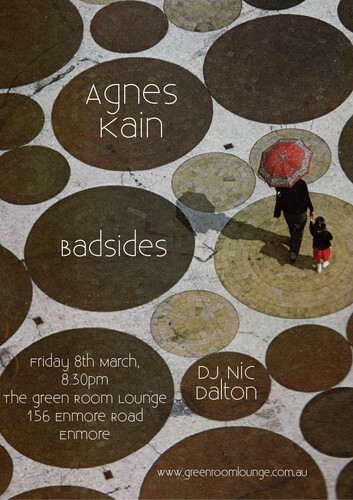 Agnes Kain are songwriters and musicians Chanelle Afford and Stefan Simunic from Sydney, Australia. They have known each other since they were 4. They have toured Australia and China a number of times and released three albums: ‘Keep walking or I’ll kill you’ (2007), ‘Across the ocean grey’ (2009) and their new album ‘Before we finally meet’ (2012). All three albums were recorded and produced by them in spare rooms, kitchens, lounge rooms and laundries in Sydney, London and Melbourne. This is folk indie pop at it’s best. Supported by Badsides and DJ Nic Dalton.